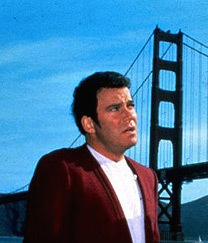 “We’re in the streets of San Francisco looking for a pair of humpback whales.” So says Captain Kirk in a helpfully succinct synopsis of Star Trek IV: The Voyage Home. Star Trek IV: Save the Whales sees the Enterprise crew travel back in time to beam aboard a couple of humpbacks and stick them in an improvised whale tank – let’s hope it’s more watertight than the plot. Along the way, Uhura steals some photons, Sulu commandeers a helicopter and Scotty invents Perspex. Why? How? What? All good questions, none of which are really addressed. No one stops to worry about meddling with the past, or whether two enormous whales will fit on a tiny Klingon Bird-of-Prey, or why you’d even consider attempting it in the first place. Accurately described by my co-goblin Alex as Terminator meets Free Willy, the film is comedic, wacky, camp even – slingshotting round the sun to retrieve some whales from the past is something you could imagine Superman doing in the ’60s. As such, the movie totally lacks the interesting sci-fi and emotional resonance of its predecessors. Nevertheless, it’s an entertaining romp through time, space and marine biology. As in the case of Thor, your enjoyment of the film will depend on how funny you find this fish-out-of-water schtick. Mammals. Whatever. It’s still fun to spend time with these established characters, even under all this comedy blubber – and I’m not just talking about William Shatner. Having been absent for most of the previous film, director Leonard Nimoy makes a welcome return as Spock, who according to Wikipedia is “still recovering from his resurrection.” Needless to say, Nimoy will be greatly missed. DeForest Kelley continues to impress as Bones, looking increasingly like an old, grey cat, while Shatner just looks like Garfield. But as soon as they arrive in 1986, also the year of the film’s release, some of the characters lose their composure for comedy purposes. Or maybe their brains were damaged during the Time Warp – something we’ve all experienced. This means Scotty tries to talk to a computer, Kirk basically abducts a lady marine biologist, and Chekov starts shouting about “nuclear wessels” and gets himself kidnapped. Walter Koenig’s accent is still better than those twins in the new Avengers movie – but why can’t the crew just beam him out of the hospital? Because the film needs an excuse for a goofy hospital escape sequence. Clearly, Star Trek IV: Free Willy Shatner is more interested in silly comedy than consistency and, you know, coherence. “You get the photons, you get the plexiglass, we’ll get the whales, and we’ll meet back here by the invisible spaceship.” That’s almost a direct quote. It’s Futurama. It’s Buckaroo Banzai. It’s completely bonkers. But if you ignore all the blow-holes in the plot, you’ll have a whale of a time. One of my favorite movies! Some awesome quotes!